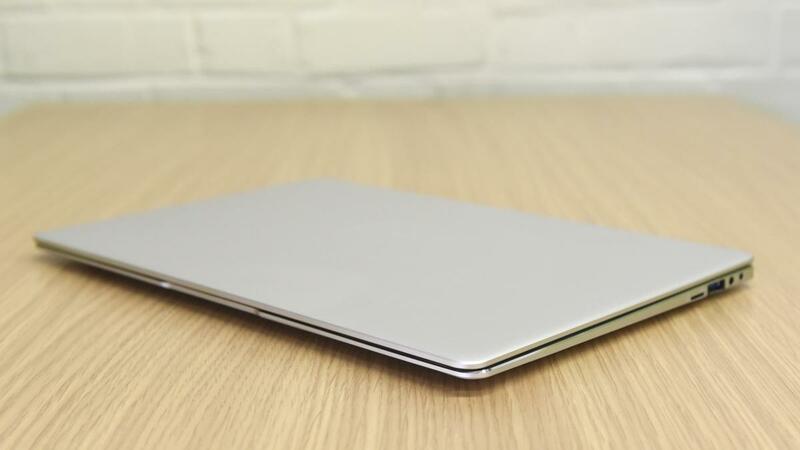 Iota Slim review: MacBook build for £150 – what’s the catch? If you’re looking for a laptop to trawl through the web, scroll through your Facebook feed or even catch up on the latest football highlights from the 2018 FIFA World Cup, then you won’t need a powerful machine. Instead, you can save yourself a lot of money by opting for a budget laptop – and by budget I mean under £300. The Iota Slim is just that: a stylish 14in MacBook Air wannabe that costs peanuts in comparison and is aimed at those wanting a stylish, portable machine that doesn’t cost the earth. 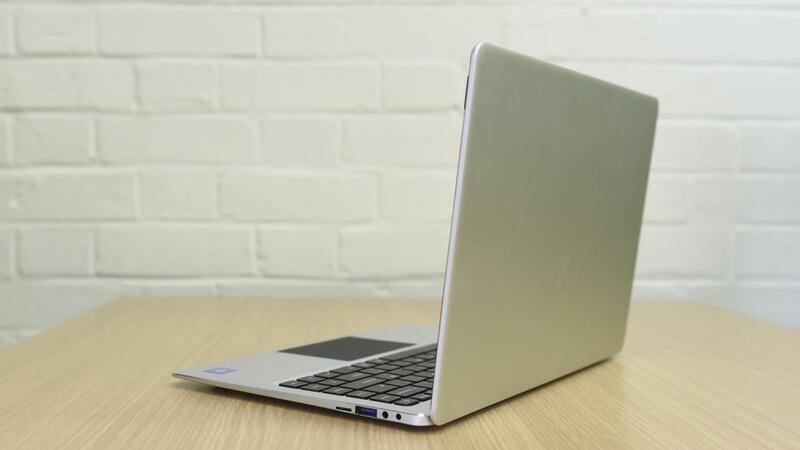 At around £150 the Iota Slim is insanely cheap for a laptop this good-looking. At this price, you get a dual-core Intel Celeron with 2GB RAM. If that isn’t enough for you, there’s a more powerful model costing £245, which comes with a quad-core Intel Pentium N4200 processor and 4GB of RAM. It might be cheap but it still faces stiff competition. 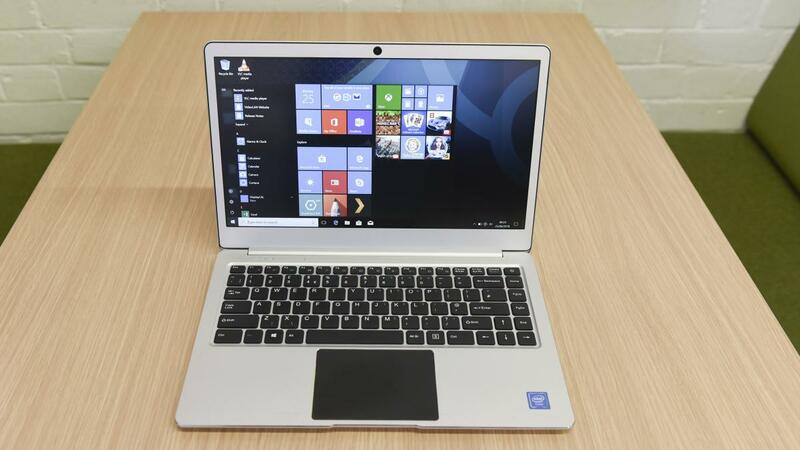 For example, you can get the impressive Linx 12X64 for £200 and the stylish Asus Transformer Mini for £230, both of which are 2-in-1 laptops and have slightly faster Intel Atom processors, though neither can match the size of the Iota’s big 14in screen. The HP Stream 11 costs £220 but has a smaller, lower resolution 720p display and isn’t as good-looking. There are also a few impressive Chromebooks around at a similar price, notably the Acer Chromebook 14 at £250. The Acer doesn’t run on Windows 10 but it’s ideal for browsing the web and basic tasks. If you were to stencil an Apple logo on the lid, you’d be hard pushed to tell the difference between the Slim and a MacBook Air. Just like the Apple machine, the Slim is built from matte-silver aluminium, has chamfered edges and softly rounded corners all round; even the Air’s trademark wedge-shaped side-profile and circular rubber feet are present. Take a closer look, however, and inevitably differences do emerge. The Slim’s non-backlit keyboard and trackpad aren’t as refined as the MacBook’s and nor is the finish to the paintwork, but it’s not bad at all for a budget machine. The spacing of the keys is perfect, the travel and action pretty are good – it’s an easy machine to type on – and the trackpad doesn’t suffer from any problems either issues. It tracks perfectly reliably. Around the edges, you’ll find two 3.0 USB Type-A ports, a microSD card expansion slot, with cards up to 64GB supported, a 3.5mm headphone jack and a micro HDMI port. There are no Ethernet or Type-C USB ports. 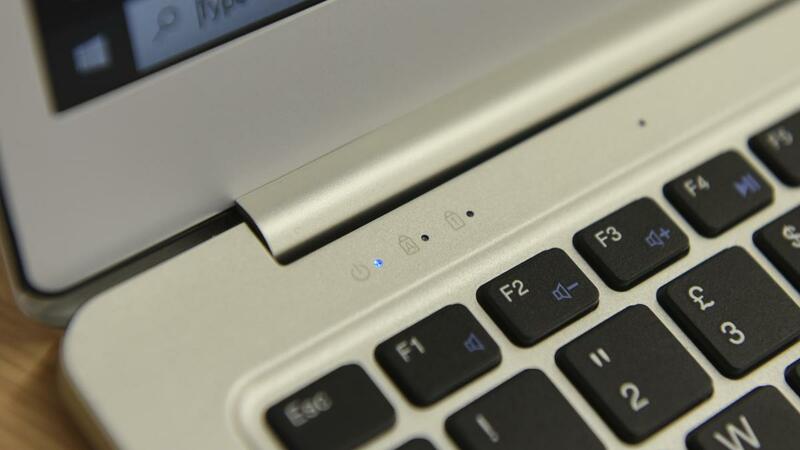 Flip the laptop over and you’ll find a compartment that can be opened with a small Phillips screwdriver. 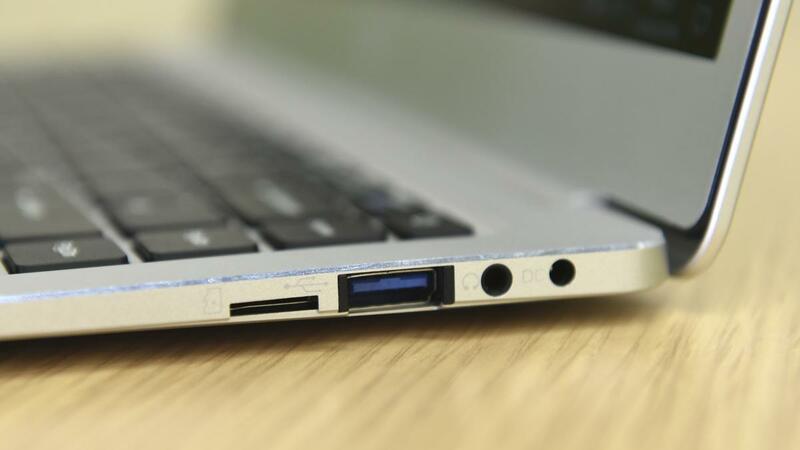 Here, you can upgrade the laptop’s built-in 32GB eMMC storage by adding a 42mm M.2 SSD. As for wireless connectivity, the Slim has dual-band 802.11ac Wi-Fi and Bluetooth 4.0. There’s also a front-facing 0.3-megapixel camera but I’m not sure how much use this will be to you as the video quality is very poor. The screen is where many budget laptops fall short, but not here. The Iota Slim has a 14in IPS display with a resolution of 1,920 x 1,080 and it’s amazingly good for a budget machine. It isn’t the most colour accurate I’ve set eyes on but it has good contrast, viewing angles are perfectly acceptable and it’s reasonably bright, too. Okay, so the colour accuracy is poor but with a contrast ratio of 1,384:1 and a maximum brightness of 239cd/m2, it’s probably the best screen we’ve ever seen on a laptop this cheap. You don’t have to step up much in price, though, to get even better. The Linx 12X64, for instance, covers 63.2% of the sRGB colour space to the Slim’s 54%, which isn’t good by any stretch of the imagination, but still better than the Iota Slim. If the screen is impressive, the Iota Slim’s performance is considerably less so. Inside our £150 model is a 1.1Ghz dual-core Intel Celeron N3350 processor with Intel HD Graphics 500 and 2GB of RAM. These go together to produce what can only be described as a painfully slow experience. The laptop struggles with the most basic of tasks. Opening up Windows Settings, Explorer and searching with the Start menu all feel slow and ponderous and, when it comes to multitasking, the Slim’s miserly 2GB RAM struggles to provide enough headroom. Good luck trying to run Chrome with more than about four or five tabs open – the laptop will take a decade to respond. In benchmarks, perhaps unsurprisingly, the Slim put in a pretty poor performance. In Geekbench 4, the multi-platform CPU benchmark the laptop delivered single- and multi-core scores of 1,135 and 1,850. The Linx 12X64 with an Intel Atom x5-Z8350 processor and 4GB of RAM on board scored 705 and 2,037, respectively. As you can imagine, it’s pretty poor when it comes to gaming, too. With an average frame rate of 9.9fps in GFXBench Manhattan and 4.8fps in GFXBench Car Chase (both onscreen), it clearly isn’t made to cope with anything remotely intensive. In the Expert Reviews 4K media benchmarks the Slim’s overall score of 7 is the lowest I’ve ever seen. It struggled, in particular, with the multitasking component of the test, which took many, many hours to complete. Battery life isn’t great either. In the Expert Reviews video rundown test, it lasted a mere 4hrs 50mins, which is well short of the Linx 12X64’s 7hrs 10mins and Asus Transformer Mini’s 11hrs 19mins. Watching two full-length movies on a long-haul flight will be a tight squeeze. As for storage, the Iota Slim is once again limited. With only 32GB of eMMC flash memory supplied as standard and Windows occupying a large chunk of that, you’ll find yourself running out of space sooner rather than later. And we all know how computers perform when they’ve got minimal storage remaining – the slow down badly. Perhaps most problematically, however, there’s barely enough space here to download and install a major Windows update and that’s before you add any of your own apps and media. In short, the Iota Slim simply isn’t practical with the amount of storage it ships with and if you do buy one I’d advise using either the microSD slot, which supports cards up to 64GB in size, or by installing a 42mm M.2 SSD in the small compartment beneath. The Iota Slim is very impressive for a laptop costing a mere £150. It looks great, its keyboard and touchpad are pretty decent and the screen is, quite simply, a revelation for the money. But if you’re thinking of buying, you need to be aware of its limitations. It’s dreadfully slow, so don’t expect to do much beyond lightweight web browsing, email and word processing. And since it doesn’t have enough storage, you’ll need to budget extra cash to add more. To my mind, if you’re looking for a budget laptop, you’d be better off with a Linx 12X64. Although it has a smaller 12in screen and is £50 more expensive than the Iota Slim, it has a faster processor, better battery life, double the amount of storage and RAM, plus all the flexibility a detachable 2-in-1 design brings. It’s better in almost every way.